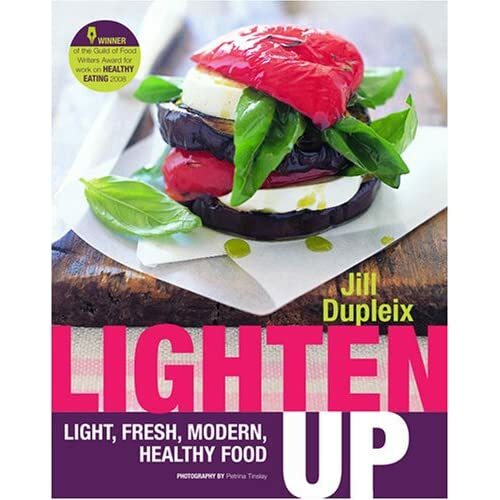 “Lighten Up” by Jill Dupleix is part of a genre: “Healthy Approach To Cooking.” You will not need me to tell you that the “HATCH” books emerge in the spring from the depth of winter’s extra layers. They spring up on shelves and in booksellers’ windows with an ostentation attitude which can be dispiriting. What an awful thought that of another load of diet food cookbooks, but this is not the case of Jill Dupleix’s latest book. Jill Dupleix was named cookery writer in 2005, and she was the Times Cook for six years; in 2008 she won the Guild of Food Writers Award for work on healthy eating, so she knows what she writes about and when she shows us how to LIGHTEN UP our cooking, she makes sure that our taste-buds will be satisfied. This books offers a gently lifestyle change without the rigours and the bullying tactics of some other “healthy diets.” Recipes do not include deep frying nor cream, of course, but the taste is never compromised. Attracted by the mouthwatering photography, I tried and tasted “Zucchin crostini.” Jill Dupleix is also a food stylist and chef at Soho’s Quo Vadis and it shows. Believe it or not, I had never poached an egg before this recipe. Why? I thought it was too complicated. Not with this book. Each recipe has an easy to follow step-by-step layout. The end product was a lovely meal: layers of prosciutto, shavings of buttery courgettes, topped by a perfect poached egg, the “lot” piled on a sliced of grilled sourdough, a delight. In this book, you will find lots of recipes to try from breakfast to dessert. Have a go at Lemon Yogurt Cupcakes. SET 10 paper muffin cases in a large muffin tray. ADD the egg yolks one at a time, beating well. FOLD into the cake mixture, alternating with the yogurt. WHISK the egg whites in a clean bowl to firm peaks. FILL the paper cases. BAKE for 30 minutes. MIX the icing sugar with lemon juice thicken. SPREAD on top of the cakes, add a berry or two or some lemon zest, and leave to set. Yesterday, I panicked and when I panic I bake. I was suppose to prepare questions for an interview with Emily Wardill, an artist who lives and works in London. I kept looking at her work, all these information and feelings were poured into my brain, sadly nothing intelligent was coming out of it. Courgette and since Ms Wardill is a respected (and possibly respectable) contemporary artist with an exhibition opening soon at the Tate Gallery, I could not decently ask her opinion about courgettes. So instead, I turned to the free ASDA magazine and baked the Courgette and Cheese Loaf which features in page 28. It is well known that courgettes won't help with the preparation of interviews. But at least the current glut which does not show any sign of diminishing, could take your mind off more important issues such as work, for a little while longer. When I had finished baking, the loaf was a little soggy at the bottom, but my resolve was cooked, I emailed a promise of a set of questions ready for the next day, panic over. Lightly beat together the eggs and milk , then pour into the flour mix and add the butter and stir with a knife to create a dense sticky batter. Pad the courgette shreds to squeeze as much water as possible out of them and add them to the mix. Beat the drum, Turn on the spot lights, it is the end of the month, time for another Daring Bakers' challenge. As we know I am not very good at following recipes to the letter and the Mallows seemed too complicated therefore I opted for the Milan Cookies. All what you need for this recipe is in your already in your cupboard. these cookies are delicious, very quick to make. Some Daring Bakers were concerned because the result was too chewy and I don't know the secret to avoid that. Mine were not perfect but they tasted great, though my tip is : bake them in a muffin tray or use a cookie cutter so that you get a nice shape. The recipe is for 3 dozen cookies which is quite a lot so divide according to your needs. This is a lovely recipe which make you feel like a really good cook. May be that is the reason why it is called fool. It is also an excellent way of using the bananas which are languish in the fruit bowl. Put the rhubarb, honey, cinnamon and 45ml/3tbsp cold water in a pan and stew gently until the rhubarb is tender. Cool slightly and place in a blender of food processor with the bananas. Run the machine until the mixture is smooth (you can also use an hand blender). Leave until cold, then fold the yoghurt. Turn into individual serving dishes and decorate with hazelnuts or a biscuit. Chill before serving. I made this recipe with Rhubarb from Anne and Oliver's allotement. It is wonderful to see all what they have managed to grow over 3 seasons so as home grown deserve a bit more publicity, I thought it would be good to link this post to Andrea Myers' Grow Your Own and enter the round up. On Saturday I was asked if I had ever used flowers in salads. Flowers in salads? NOooOOo. I left it to that and went about my week-end activities, visiting friends on their allotment where I notice that some people grew Marigolds close to their vegetables. Could that be because they eat flowers too? I am a little careful careful picking things "willy, neely" from the garden since I mistakenly cooked next door neighbour's weed, genuinely believing they was chard, almost poisoning him. So this time, I opted for the upmarket grocery store in Greenwich, where I was explained that if I wanted to add a romantic touch to my Caesar Salad by adding edible flowers, I could not do so on the spur of the moment. Petals had to be ordered, and I was given a list of "Favorite Edible Flowers for Salads"
Pick flowers just before you are going to use them. Wash them quickly in cool water, shake them out and dry on a paper towel. It would be nice to see more recipes with edible flowers, they make a dish look rather special and surprise for the taste buds. You know the fridge magnet effect, well the following question "do you want to bet?" has the same effect on me. As a rule, I never go to the bookies, as a consequence, the house resonates with the question, "do you want to bet?" I could bet on anything, and lately a recurrent bet has been going on: the number of roses we will get on each rose bush. I WON the white roses, that was the big prize: dinner for 2 at a restaurant of MY choice. Locally there are 2 Argentinian restaurants. I fancied steak and chips with a bottle of Malbec and gooey Dulce de Leche. everything was nice, setting looking over the heath is very nice on a summer evening, food was good, company lovely but the waiters felt the need to lie. Looking back, I came to the grim realisation that given the chance to waiters will far too often do. This time, we were left in front of a glass of water for a little while, they obviously had forgotten to bring the wine, apologies accepted, no harm done. But it did not stop there, main course got forgotten too. After 20 minutes, I looked pale and faint, when a waitress spotted my distress, she rushed to the table; " you have not been forgotten", could have fooled me. She dashes towards the kitchen, comes back beaming, "it take longer because his, is well done" blimey! half an hour on the parilla (grill) that surely should do the trick. See, here, there was no need for a little white lie, the restaurant was packed, orders get forgotten, shouldn't happen but it does, so what? Erase the service charge, bring me a complementary whatever, and I will be happy. Aren't waiters trained for the eventuality of something going wrong? because it seems to me that in restaurants there is no lack of opportunity for things to go wrong and something always does. Here is a great Tomato & Chilli Salsa which I found in "one hundred Home-made dips" by Dawn Stock, a great little book completely unpretentious, packed full with recipes that work. Place the tomatoes, onion, chillies and coriander in a bowl and mix thoroughly. Season well with freshly ground pepper. Cover and chill. Transfer the salsa to a serving dish and garnish with coriander leaves. Serve pieces of different coloured peppers, cut wide enough to scoop up the salsa and tortilla as accompaniments. In the series "What is in your cupboard?" I rediscover a packet of organic dry split peas. A whole packet which was trying to negotiate its way towards the back of the cupboard. Day in, day out, I noticed that it was slowly but surely wiggling towards obscurity. "right this is it", I thought, grabbing the shifty packet. On closer examination, the recipe printed on it did not appear too difficult: Split Pea & Lemongrass Croquettes. don't be put off by the word lemongrass paste, I made my own by whizzing a lemongrass in the blender, and that is rather easy to find in grocery shops, I got my lemon grass in the local supermarket. The consistency is the key of theses croquettes, it has to be rather thick prior adding the egg, on my first attempt, I was tempted to add a little water and that was a mistake. You may be correct to think that this recipe is time consuming, however most of the time goes in soaking and simmering which does not need you to be around. In a saucepan place yellow split peas and bring to the boil in the stock. Reduce and simmer for 20 minutes, stir occasionally until peas are soft and sticky. Scoop out enough mixture to shape a small sausage shape. Gently fry these in frying pan until golden brown and serve while warm. The croquettes themselves are rather nice, perfect picnic material, shame that it was raining on and off, last Saturday when the Beer & Jazz festival was in full swing. Croquettes had to be devored some place dryer, on that occasion.